Arrived in Xi'an on the train this morning. It's still pretty grey, overcast and damp here. But we got a transfer to the hotel and had some french toast for breakfast (ours rooms weren't ready immediately). And then after we'd all showered, we caught a taxi to the Han Yang Ling museum. Which is basically this fantastic underground museum, built around the semi-excavated burial pits at the Emperor Jingdi's tomb. The only downside is you see no actual long-dead people, but other than that, it's all pretty amazing. I was completely awed by how much they've found in the small amount they've dug up so far. The ceramic animals were incredible: dogs, sheep, pigs, chickens, goats, oxen and horses. Along with loads of people. 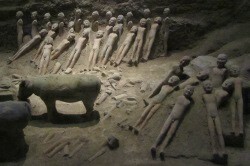 Much tinier than the famous larger than life terracotta warriors, but en masse and intricate none the less. 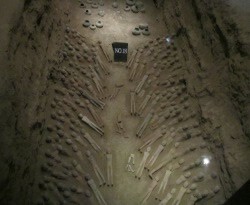 Makes me much more excited for tomorrow (when we visit the Terracotta Army!). We went to the underground museum, watched a 4D movie about the history of it, visited the South Gate and went to another archaeological museum nearby that had even more of all the items, but you could see them much closer up here. Fascinating. That was pretty much our afternoon. By the time we got back to the hotel, the rain had really set in. We spent some time at our very awesome hostel, Xiangzimen Youth Hostel, desperately trying to connect to their wifi (which everyone else seems to have no issues with, but I only managed to connect to once and just before we left for the museum :( ). No luck. That evening, we headed out in the pouring rain for our orientation walk, which we'd put off earlier (to get to the museum sooner). It ended in the Muslim quarter where we'd planned to have dinner. We did a bit of shopping first because it really seems like we'll have very little free time in Xi'an, what with the warriors tomorrow during the day (and I gather it's a 1-2hr trip to get there) and we've booked dinner (a dumpling buffet) and a show in the evening. Aside from getting quite drenched by the rain, we did stop and have some noodles (real ones this time!). They're sposed to be really good here, but I wasn't blown away to be honest. That said, not since Thailand do I remember any of my trips having such good meals. What a pleasure!